The concept behind this newsletter is that anyone with 15 minutes to spare can learn about our research work. In this Jan-Mar 2017 issue of our newsletter, we have included interesting open access publications, news, blogs, reports, tweets, and training information produced by our group. - News & Publication - Prevalence of drug resistant HIV at 'alarming levels' in Aruba. 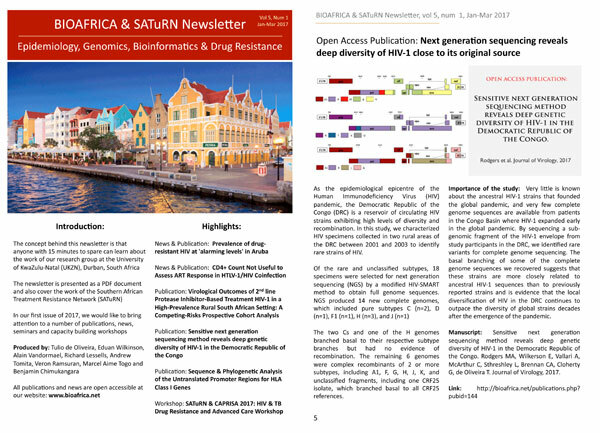 - Commentary: Extreme High-level of Drug Resistance in Aruba: We need Integrase-Based Regimens Available Globally NoW! - News & Publication - CD4+ Count Not Useful to Assess ART Response in HTLV-1/HIV Coinfection. - Publication: Social disequilibrium and the risk of HIV acquisition: A multilevel study in rural KwaZulu-Natal Province, South Africa.